‘Imagine’ is a light treatment on the creative process. Anyone familiar with Lehrer’s previous work or that of other pop science writers will feel right at home with this book. Lehrer’s writing is clear and his use of New Journalism to convey complex scientific ideas through stories makes what could be daunting material very accessible. As a result, the book spurs ideas on a number of levels–cognitive, artistic, and social. Of course, the style also means that the text is rather superficial and leaves the reader begging for a more penetrating study. This is not due to the book’s scope. It is aimed at explaining ‘how creativity works’–an awesome concept to be sure–but Lehrer does not provide a central thesis to this end. He surveys a number of fascinating aspects of the creative process–insight, novelty, hard work, team work, environment, and others–but seems to shuffle through them without truly grasping their essence. As a result, the various themes feel disparate and disconnected. One example stands out: In the first chapter, Lehrer talks about the necessary condition one must be in for insight to arise and innovation to occur–a stress-free, relaxing environment. Then, in the third chapter, he talks about how this isn’t necessary and how stimulants and other drugs help to narrow focus and thus lend to productivity. Some people are creative because they treat themselves to relaxation; some are creative because they plunge themselves into a stressful, energetic environment. As such, the reader has nothing to hold onto and so does not feel any closer to understanding. 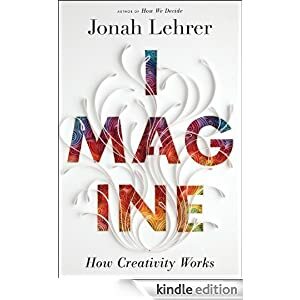 This is reconciled to some degree in the fourth chapter when Lehrer explains how natural conditions such as mania and depression (and manic depressive syndrome) contribute to an organic push/pull of creativity. While it is certainly an interesting thought, the proof isn’t quite complete. More importantly, the theme deserves a more comprehensive foundation on the science of mental processes. While Lehrer does an admirable job of explaining psychological phenomena with physiological causes, the basics are left rather untouched. We know that the right hemisphere emits alpha waves to spark insight and that amphetamines increase the amount of dopamine transferred between neurons, but we don’t know what a thought is, how we learn, and what is going on in the brain when we imagine something. As an avid reader of popular neurology, I can say that most of this is far from being understood. But, if it is not understood, it would still help to acknowledge this fact and simply formulate the theory around that contingency. As it is, Lehrer makes it seem as though this foundation is irrelevant. It must be said that this book is valuable for simply spurring these questions. It is clear that Lehrer has access to some of the best insight in popular science today. Read this book for that insight, and then use it to come up with your own theories on the creative process. This entry was posted in Good Reads, Inspiration, Sociology. Bookmark the permalink.